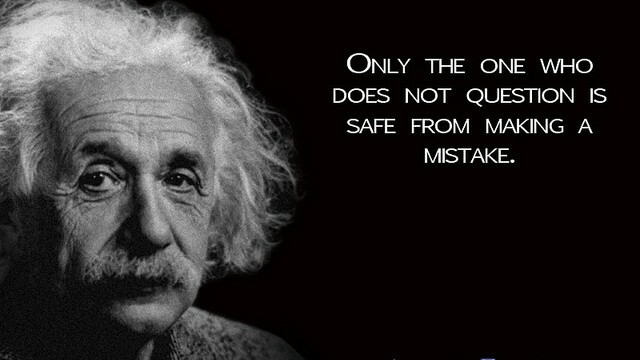 Einstein understood that questioning is critical to learning and solving problems. If he were alive today, Einstein would see a world in which questioning has become more important than ever before. But he might also be left wondering why, for the most part, we still don’t encourage questioning or teach it to our children. Let’s start with the growing importance of questioning. Perhaps the best evidence of this can be seen in today’s high-tech world. The leaders of Facebook, Amazon, Google, and a number of other leading companies are known as consummate questioners who constantly ask, Why should we settle for this? and What if we try something different? A number of the top executives in Silicon Valley were educated in Montessori schools, where their curiosity was given room to roam at a young age. Are our schools doing a good job of preparing students for a world where questioning is a survival skill? If anything, the ability to ask insightful questions will be even more critical tomorrow than it is today. As change continues to accelerate, tomorrow’s leaders—and the larger workforce—will have to keep learning, updating and adapting what they know, inventing and re-inventing their own jobs and careers through constant, ongoing inquiry. Given all of this, it’s worth asking: Are our schools doing a good job of preparing students for a world where questioning is a survival skill? Data on student question-asking, gathered by the National Center for Education Statistics, is not encouraging. It shows question-asking declines steadily throughout the school years [PDF of the report]. Interestingly, a separate study from Gallup shows that “student engagement” is dropping at about the same alarming rate as questioning. A number of factors may contribute to a decline in questioning-asking. As kids mature and begin to “know” more, it’s understandable they might feel less need to ask. But Harvard University education professor Paul Harris points out that young children also seem to feel less safe asking questions as they move from being at home with parents to being in a classroom with a teacher and other kids. To make matters worse, peer pressure may also be inhibiting student questioning. Jack Andraka—who, at age 16, developed a breakthrough new way to screen for cancer—is an incredibly curious young man, but even he doesn’t ask many questions in class, he told me. Andraka says the teachers at his high school aren’t particularly welcoming of his questions, and beyond that, among most students it’s seen as “uncool” to ask questions in class. There are no easy solutions to this multi-part problem, but if we want kids to question more—and as Einstein told us, the way to get to better questions is by asking more questions—then we may need to find ways to make the act of questioning both “safe” and “cool.” The Right Question Institute (profiled on MindShift), a nonprofit group focused on teaching questioning in schools, encourages teachers to run group exercises dedicated entirely to formulating questions. RQI has observed, and teachers using the program back this up, that when you actually allow and encourage questioning in this way, students tend to be more comfortable and willing to ask questions—and some even take pride in the questions they ask. As for making questioning cool? Here’s a thought: Teachers might try pointing out all the “cool stuff” that has resulted from questioning. Those smartphones kids love, and many of the apps on the phones? They only happened because someone was willing to question the status quo. Indeed, kids should know that the true innovators in art, music, even sports—everyone from Beyonce to that free-thinking Olympic snowboarder Sage Kotsenburg—are often those willing and able to ask “Why not?” and “What if?” You don’t have to be Einstein to understand that this aptitude for questioning is, itself, a pretty cool “app”—and one worth figuring out how to use. Warren Berger is the author of A More Beautiful Question: The Power of Inquiry to Spark Breakthrough Ideas (Bloomsbury). On Einstein’s birthday, he invites readers to visit QuestionDay2014.com for ideas on celebrating the importance of questioning.